As promised, here is the recap of Sunday's stairathon. For anyone in the dark, the stairathon was a personal challenge I set for myself about a month and a half ago. I was broke (teaching = all summer with no paycheck) and wanted to do something to get more physically fit. There were posters all over the city for the Chicago Marathon on 10/10/10, and so I decided to make that my special day, too. 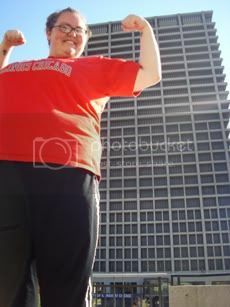 Since a marathon is still far away in terms of physical preparedness, I decided to try and climb the stairs in my office building - a 28 floor highrise. I started out on September 4, a Saturday. I decided to start at the basement and see how far I could go. After eight minutes, I was up on the fifth floor, and I thought I was going to die. My legs throbbed, my lungs felt heavy, and it hurt to breathe. I didn't think I would be able to make 26 floors in just a little over a month. I told a few friends that I would be doing the stairs, for two reasons - one, to make myself accountable, and two, to have someone there in case I died on the stairs. It was a legitimate concern. I made a chart and planned out my daily stair routine, gradually increasing the floors. After over a month of training, the morning of October 10th came. 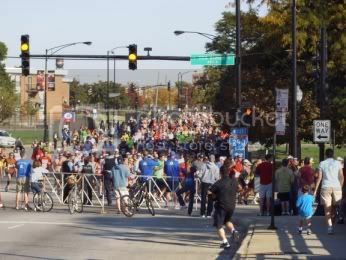 My sister and I headed downtown for my event, and as we boarded the Blue Line, the marathon runners were passing by, starting mile 16. It was profoundly inspirational, and I hope to be one of them someday. We met up with Lorelei (a friend of mine from work), my cousin Sarah, and Sarah's boyfriend Marty, and we all headed into the building. Lorelei was in charge of water on floors 8, 16, and 24. Sarah was in charge of the stopwatch. My sister Katie was the official photographer. And Marty held my training chart and a Sharpie so I could mark off finally finishing. We headed down to the basement and I did some stretching. Then, I was off. I think it's important to note again that the first day, I did five floors in about eight minutes. I wasn't really interested in timing myself during the race - it wasn't about speed, just completion. I wanted to set a goal and meet it. Unofficially, though, I prayed I would be able to finish it in less than an hour. After the first day, I was really concerned that I would not be able to make it. I started up the stairs, and everyone else headed to the elevator to meet me at the first rest point (the fourth floor). While training, I had been making sure to stop every four floors or so to breathe for about ten to fifteen seconds before carrying on. So, as I headed up the stairs, I hit four, and no one was there. 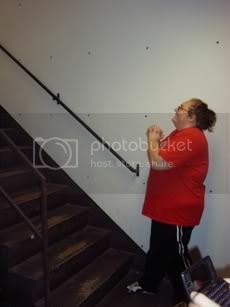 I breathed a little, and just as I was about to move on, they entered the stairwell. I had beaten them there! At first I was thrilled, but as I moved forward towards the next resting point (and my first water point), my mind raced. Adrenaline is a powerful thing, and it was pushing me above and beyond the limits I'd set before. But I didn't want to go too fast. I didn't want to "hit the wall," so to speak, before reaching my goal. So I carried on, stopping every four floors for a few seconds and stopping every eight for a bathroom-sized Dixie cup of water. I passed all the landmarks I had come to notice while training - like a used dryer sheet in the corner of the landing between floors 7 and 8, and a sticker someone stuck to the wall between floors 15 and 16. I remembered so many specific moments from my training - as I passed floor 7, I remembered how impossible seven floors once seemed. And the same for nine. And fifteen. And twenty. And I thought about all the days when I was tired from working, stressed out, dreading the stairs ... and how I pushed myself to do them anyway, knowing that all my hard work would eventually pay off. 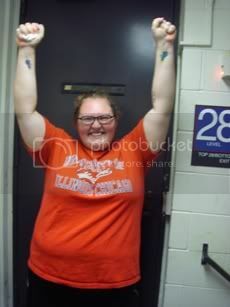 Finally, as I charged up the stairs to floor 26, I was overcome with a feeling of success. I did it. Me! Mary! The girl who used to take the elevator up one floor to see the secretary! 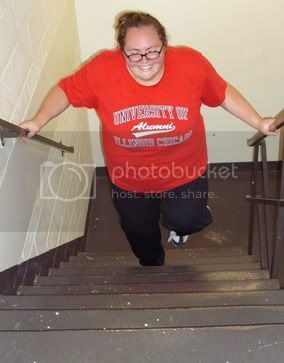 I raced up twenty-six floors - or fifty-two flights - of stairs. I freakin' did it! Everyone was there, cheering me on. As I reached the stop, I called out, "Time!" Sarah had gotten distracted for about a second or two, so she quickly went to check the stopwatch. It would have been under nine, but that hardly matters. A month and a few days earlier, it took me almost that long to do five floors. Now, on 10/10/10, I did nearly the whole building. It was incredible. I didn't cry, though I kind of wanted to. We walked around the 26th floor, and I didn't think about being publicly sweaty or wonder if the pictures Kate was taking made me look extra fat because of bad angles. It didn't matter. I was a champion. I set a goal, and I not only met it, but I exceeded my own expectations. I pushed myself, and I ended up doing something remarkable. But remember, my building is 28 floors, not 26. I had done nearly the whole building, and I was feeling unbelievably powerful. Unstoppable, even. 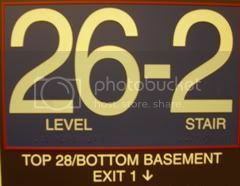 So, after finishing walking a lap around the 26th floor, we headed back to the stairs, and I (untimed) went up to 28. We couldn't get in to walk around and take pictures out the incredible scenic panoramic windows they have up there, but it hardly mattered. We walked back down to 26, then took the elevators to 16 (where my office is) for a small party in the conference room. I had wanted to bring cupcakes to celebrate, but they came out completely awful (my baking skills are getting rusty - which I am mostly okay with, except that it was kind of wasteful), so I brought everyone apples (and a banana for me!). I stood at the lectern and gave a little speech - I had thought about speaking, but I didn't prepare anything. I just got up and spoke from the heart. I told them about how that was the room I had defended my Masters research in, how I wanted to live a healthier lifestyle, and how grateful I am that I have their love and support in my endeavors. 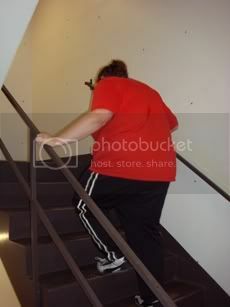 I started out someone who took the elevator for single flights of stairs, and now, 48 pounds lighter, I can master the whole building in under ten minutes. It was perfect. Marty told me later that he almost cried - that meant an awful lot to me. Congrats!! I am so happy you were able to complete your goal... and in an amazing amount of time too!! I have total faith in your couch to 5k challenge!! Yay! I am soo proud of you! WOW!! What an awesome story! I am so thrilled for you and proud of you!! And how wonderful for you that you have such loving and supporting friends to share that moment with! The smile on your face says it all.....you look so happy and proud and you should be...WAY TO GO!!! I look forward to hearing all about your C25K challenge. And by the way, I love that you took fruit instead of cupcakes for celebrating.....Yay for ruined cupcakes!! Aw, this made me tear up a lil' bit! Way to go!